It's springtime and I'm getting ready for the wonderful time ahead. Warmer weather and welcome changes. Looking for something a bit different I was inspired by seeing a group of colorful ribbon at a local craft store. "Spring flowers" I thought. And in my favorite colors! I knew I had to whip something up, something simple and inexpensive. Something decorative, shouting out: It's Spring! What, you say would that be? A tablerunner, that's what. It's the ultimate expression of the season for décor and entertaining! You can make one for each: Spring, Summer, Fall and Winter. And you can put a tablerunner together in no time. For me, burlap is the ultimate, cheap, go to fabric. And ribbons are so colorful, and plentiful! Combining the two makes for an awesome showing. And what a wow factor change! Since one side of my burlap fabric was already fringed, a quick option would be to make the entire runner fringed all around instead of folding over seams. Once you've decided on the length and width (including fringe) based on the table or buffet you want to cover, simply pull a thread out of the burlap to get a straight line. The first time I did this I realized the width I decided on was too wide for my buffet. Since I had already started the fringe, it was easy to just cut the fringe off evenly and start a new line for the fringe shown in the picture. Pulling the threads away to form the fringe was so easy to do. Next, I cut out three round burlap disks (1 3/4" in diameter,using the bottom of the glue container as a pattern) and ironed on heat n bond for stability to glue the ribbon to. Burlap is an open weave and the glue would easily flow to the back of the burlap and I wanted to prevent this. I cut 3 1/2 inch strips of ribbon for the first row. I had additional ribbon in a color that I loved and used it first in the 3, 6. 9. and 12 positions, gluing (hot glue) each strip together to form loops. I tried to follow the color layout of the purchased ribbon after gluing the initial four ribbons. For the second row, I cut the ribbon into 2 1/2 inch strips and glued them down like the others. Once that row was complete, I cut out another burlap disk like the first and glued it to the center to cover the ribbon edges and for a neater look. It's beginning to look like a pretty loopy flower, doesn't it? For the flower stems I measured where I wanted the flowers placed on the runner overhang and then cut out strips of green ribbon. I put a little hot glue on the bottom end of the ribbon next to the fringe just to get started. Once in place, I glue down the entire ribbon using fabric glue and following the burlap thread for a straight placement. I used fabric glue for a smooth look which I don't think I would have gotten with hot glue on ribbon. *Remember to place a protector (I used parchment paper) under the burlap for any glue that might seep through. I love the look of the ribbon flowers on top as well as hanging down. And finally, repeat the same process for the other end of the runner. I used two packs of the muti color ribbon @ $1.99 each from AC Moore. The burlap was 3.97 a yard at Jo-Ann and with a 50% off coupon . . . the entire runner was done for less than ten dollars, including all other supplies. I do hope you like this Loopy Ribbon Flower TableRunner and are inspired to make one! Remember, you can make this in any color palette . . .
your table runner shouts spring...and I love it! You did an amazing job. So pretty! Love your creativity. Wonderful to have you at Seasonal Sundays! Love your use of ribbon to make the flowers. Fun and easy! Gail everything ou do is just so pretty, I love this runner perfect for spring. Absolutely adorable and so Springy! You are so creative and I love the colors you chose. Pinned so I can try it! How pretty! I love the ombre style of the petals and the way it matches your wall art DIY! Another beautiful spring project! Very cute!! thanks for the tutorial!! Just might have to try this some day! thanks! You had me at "no sew"! I love your runner. I saw it on Hometalk and started following you on Hometalk too. Love your table runner Gail - so glad you linked it with us at the DIY Sunday Showcase Party! I've pinned it to our DIY Sunday Showcase Board as well. Sooo pretty Gail! Love that you used ribbons to make the flowers. Very clever! I love this Gail! The colors are so vivid and eye catching! Happy Spring! I love your table runner! Thanks for the tutorial. This is so pretty, and easy. Thanks for sharing. So simple, yet so easy. Thanks for the inspiration. Happy Spring. Thanks for the idea of heat bonding the burlap disk for the ribbons. It is both lovely and loopy - just right for a touch of spring. I bet you have more than four table runners, though. Such a cute table runner and just your colors!!! Thanks for sharing how you made it. I like that it has a three dimensional look to it. That is just adorable! Thanks for the tutorial. I'm so ready for spring! ADORABLE!!! You are so criative Gail!!! Thanks for sharing another great tutorial! So cute! Even I could do this! Hi and wow how beautiful you runner is and you are so creative. You are always making something so nice. Have a nice vacation. -- March MADEness. My blog is called Crochet with Linda Dawn and this week I am showing the progress I have made with my "Granny Square Grape Waistcoat project"
I LOVE it! So easy and yet so fun and colourful. I'm going to be pinning this and sharing it on my FB page! This is a great DIY and I will be sharing it with a friend who is having an event using burlap. Thanks for sharing and linking up with us at the #WWDParty. Have a wonderful week ahead. Love your table runner! It is adorable, and so springy. Great tutorial, easy to follow along, and very inexpensive to make. Thank you for sharing your tutorial, and hope you have a great week! Found you through Go Crochet Crazy, I love purple and think your blog is fabulous!!!! Adorable!! I followed your link from Rustic & Refined ;) Have a great week! Still loving that table runner Gail! and I was so glad to see you link up, it was like seeing a purple friend come knocking with flowers in her hand! So pretty and creative! What a really awesome job. beautiful! and pretty easy to do! 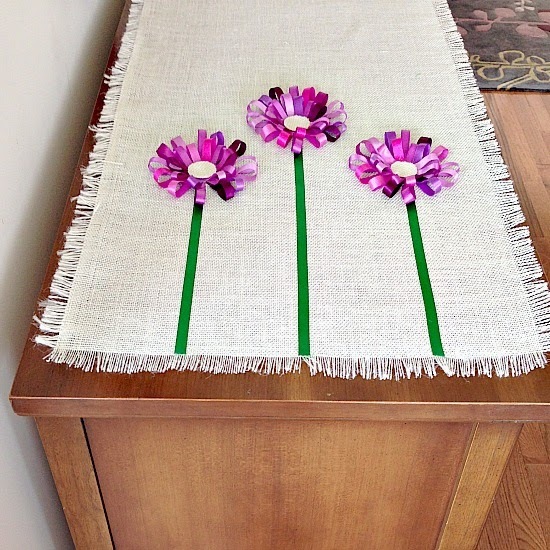 I can't wait to make a runner for myself and since I LOVE purple will probably do purple flowers :) awesome tute Gail! This is beautiful, Gail. Thanks for showing us how to make one. I love the purple flowers! What a fun craft!! Great table runner! Love the flowers. It is adorable, and so springy. Great tutorial, easy to follow along, and very inexpensive to make. Thank you for sharing your tutorial about making this ribbon flower.